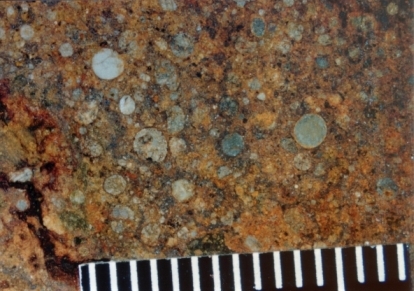 One of the more heavily debated topics within the field of meteoritics is the origin of chondrules. These are the small, spherical silicate inclusions from where we derive the technical name for the most common type of meteorites, the chondrites. With few exceptions, chondrules are found in all chondrite groups in varying quantities. Sometimes we’ll see chondrites that are nearly 70% chondrules and in other cases, we’ll see chondrites, such the Ivuna, that contain no chondrules. In the simplest of terms, chondrules are composed of olivine and/or pyroxene, occasionally glass and a smattering of feldspar. In not so simple terms, chondrules are a hot mess of textures and compositions- messy enough that I’m not going to cover it in this post, but I did delve into it a bit in this older Meteorite Monday post about our enigmatic friends. Even more messy than trying to explain their myriad of characteristics is the explanation of how they came to be. 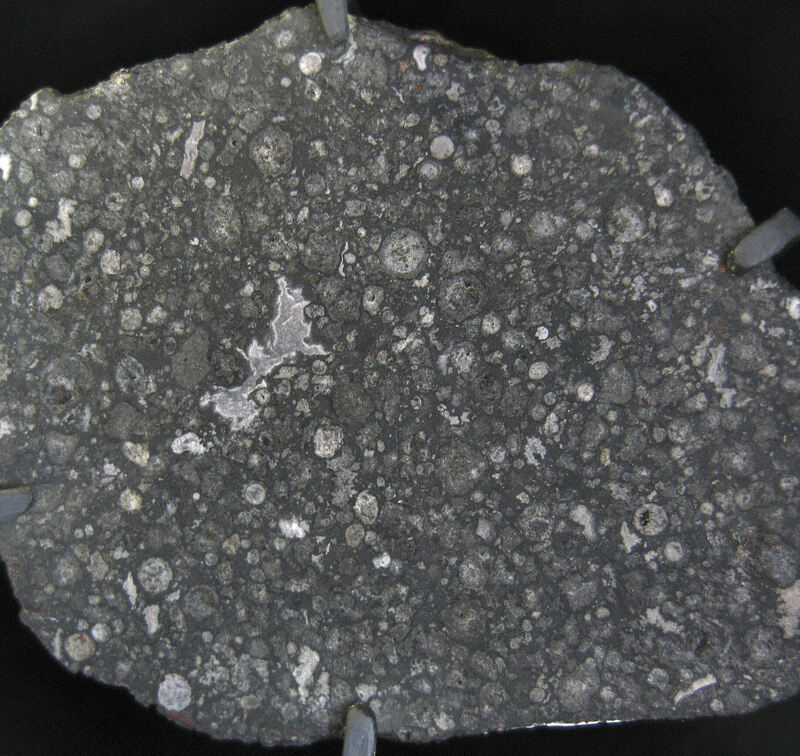 The traditional trope is that the majority of chondrules formed in localized clusters from the nebular dust found in the accretionary disk. This occured either during or right on the heels of the oldest known objects in the solar system, calcium-aluminum inclusions (CAI’s). Through Pb-Pb, 26 Al-26 Fe, and few other forms of isotope dating, we know this time period to be between 1-3 million years after the formation of CAI’s. This formation took place in the suns accretionary disk where multiple heating events caused chondrule precursors to melt and resolidify. Many mechanisms have been proposed to explain the flash heating experienced by chondrules: shock waves from passing protoplanets in the disk, lightning discharge, solar radiation, and a combination of lightning and solar radiation, the X-wind model. All of these proposed mechanisms explained a few characteristics of chondrules, but also left some questions unanswered. Theoretically, the lightning concept could explain the localized melting that is thought to have occurred in the accretionary disk. However, it’s not known if this phenomenon was widespread enough to be melt most of the chondrules present. In essence, it may have been too localized to get to the job done. Shock waves and solar radiation could also explain the rapid heating needed to produce chondrules, but this doesn’t allow for the slow cooling favored by CAI’s. The X-wind model attempts to explain all this by suggesting that CAI’s were formed first during a period of higher heat in the solar nebula, followed by the formation of chondrules in a zone that was shielded, and thus at a lower temperature. Both CAI’s and chondrules were then dragged towards the inner edge of the accretionary disk where they remelted and then jettisoned by the X-winds or swallowed by the young sun. Those that were jettisoned could then fall back into the accretionary disk, to be recycled and then accreted into the newly forming planetesimals. This model is the one that’s currently favored, but has had many addendum’s attached to account for the varying thermal histories among the CAI’s and chondrules. In spite of this, the X-wind model still has a lot of issues that has led to a lack of acceptance by everyone in the meteoritics community. I tried finding a suitable sketch to illustrate the X-wind model, but I couldn’t find one that I could legally use. Instead I went with this image From the Hubble Space Telescope. 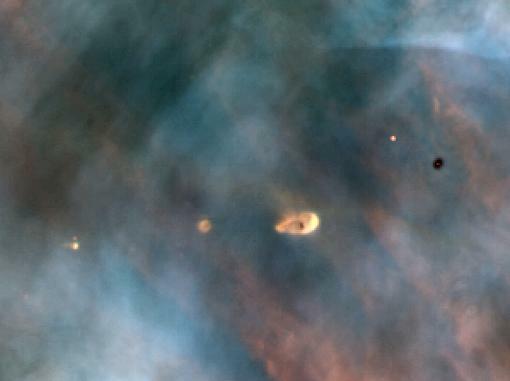 It’s of a young star in the Orion Nebula with its own accretionary disk. It’s likely the same processes that formed our solar system are occurring here, as well. Another model that has been proposed to explain chondrules involves rapidly forming planetesimals that collided and sprayed their molten interiors into the dusty solar nebula. This model was first proposed in 2000 by Lugmair and Shukolyukov at the Leonard Award Address (you can find the article for free here) during the Meteoritical Society meeting in Chicago. The basic idea is that the first accreting planetismals incorporated a high amount of the isotope aluminum 26 into their bodies. The breakdown of that isotope generated enough heat to cause rapid melting of the interior of the planetismals. When these bodies collided, they essentially sprayed their interiors as droplets into the dusty region thereby creating chondrules. This model was considered a bit heretical when proposed because it was vastly different from what was currently accepted. However, new research coming out of the University of Chicago is showing that these impacts between planetesimals is probably the better explanation for chondrule formation. All of this came about by the discovery of tiny amounts of sodium in one of the primary minerals of chondrules, olivine. Sodium is a volatile element and would rather be in the gaseous phase at the temperature which olivine forms. But, with enough pressure, you can essentially trap sodium into its liquid phase where it’s taken into the solidifying olivine crystal. Such pressures can be attained through planetesimal impacts. Then there’s the question of how do you incorporate iron oxide into the chondrules? The new explanation suggests that the accretion of planetesimals pulled water ice into their nickel-iron and magnesium silicate dominated bodies, or matrix. As the aluminum 26 broke down, it melted the ice which reacted with the metal to produce the iron oxide. The iron oxide was then worked into the magnesium rich silicates which were reforming in the interior of the planetesimal. The eventual collision between the bodies ejected their molten interiors as droplets into the solar nebula. What’s interesting about this model is that it removes chondrule production from the solar nebula, thereby simplifying how we explain the formation of CAI’s. Both types of material are assumed to have over lapping formation times, but under different thermal histories. And it’s been this shared formation time that has presented some problems. But by decoupling the two from each other, it’s likely we’ll have have a more simplified explanation for how chondrules and CAI’s formed. This entry was posted in Uncategorized and tagged chondrites, chondrules, Meteorite Monday, meteorites, science by glacialtill. Bookmark the permalink. I’m very much a layman in this area, so please indulge me here: Doesn’t this Lugmair/Shukolyukov model suggest that there should be remnants of these early-forming planetesimals that are actually older than the oldest chondrites? That it does. And if I remember correctly there are some iron meteorites and basaltic achondrites (meteorites without chondrites) whose ages are older than that of the chondrules. It also shows that planetesimals were differentiating within the first couple million years of the solar system.